The Chrome Dev tools provide a lot of functionality to you as a developer when making changes to scripts, CSS, HTML or testing out the performance of a page. 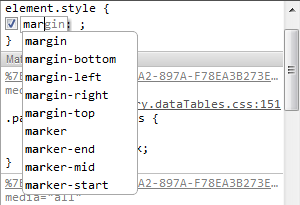 One of the great features of editing CSS is the auto-complete that allows you to quickly add style elements. Begin typing and Chrome will provide a list of matching CSS properties, use the arrow keys to select an item, hit tab and you'll then be able to set the value. When setting a value hit ctrl+space and you'll get a list of values appropriate for the property.